← Want Kids to Walk the Walk? Then Chart the Talk! We were thrilled to see and reconnect with so many teachers and Chartchums followers at the Teachers College Reading and Writing Workshop 86th Saturday Reunion. We were inspired by Kathy Collins who reminded us that we are teaching children for life, not just for school and she suggested we find the simplicity, the essential elements that stand the test of time, like Shaker Furniture, in our teaching. We agree and try to do that with the charts we create. This week we are revisiting an earlier post on nonfiction charts that can support both reading and writing since many of you have told us you are trying to help your children actively read and write informational texts. With the adoption of the common core state standards, many schools have seen an increased emphasis on nonfiction reading and writing. Many of the schools we work with across the country are beefing up nonfiction libraries, working on nonfiction writing year round, and incorporating plenty of nonfiction into their read aloud and shared reading time. What can happen when we teach nonfiction is that we get caught up on the content and forget the valuable reading skills that children can gain from reading informational books and will further develop through the reading of just right nonfiction texts. 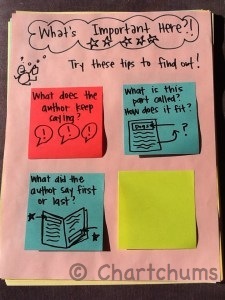 In this post you will find a variety of nonfiction reading and writing charts intended to support a classroom of second graders, but can easily be tweaked to support any grade level. A chart-in-progress to support determining importance. This is a chart that might be used to support nonfiction readers who hang on to the coolest fact as the most important one. You know the experience; after reading an entire book about sharks you ask about the most important information, and all you hear echoed back is the one line about how sharks can smell a drop of blood from miles away. (true- its why Kristine gets knee deep in the ocean and then runs back out). The tricky part is, for some children, that is THEIR most important part, but that may not be what the author was trying to emphasize. There are a few strategies listed to tie children back into the text. Depending on the level and style of nonfiction book your children are reading, these strategies may not work. If your children’s books have no headings, well then using the heading is going to be awfully hard. It is helpful to study your students’ materials before jumping into your teaching. Again, this chart would be stickier and stronger if the samples were from texts you read aloud or from leveled texts you used during your lessons. 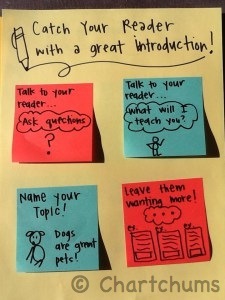 A chart to help students write stronger introductions. Starting in Kindergarten, children are expected to name a topic, then in first and second grade the CCSS talks specifically about children being able to introduce a nonfiction topic in their writing. It seems worth assessing if children can do this well. If not, you might teach, and then chart, some of the above strategies. This chart could look many different ways. 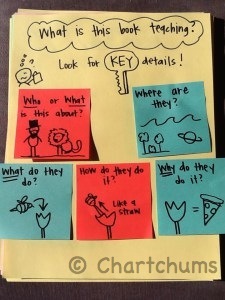 This one lists the strategies out of context, but you could take a great nonfiction introduction from a read aloud, write it on chart paper, and mark the same things in context on that introduction. If one introduction doesn’t support the strategies you want to teach, you could mimic Rosie’s chart, “Leads to Hook Your Reader!” from “Checking in On Charts” and replace the fiction mentors with nonfiction ones. Finally, you could use student work to show examples of what each of these things look like in action. There is a very fine line between inspiration and copying, and when children mimic examples that you have posted they are using them as a powerful scaffold. The next introduction they write may not need to lean so heavily on the models. 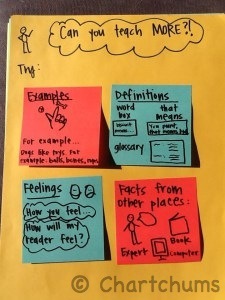 A chart to support elaboration in nonfiction. The standards for nonfiction writing mention “developing” your topic, which to us sounds like elaboration. For each strategy, there are multiple ways this can be done. For example, to give definitions you could: use a word box, a glossary, or an in-text definition. Even when something is named in the standard, like definitions, we want to give children choice in how they approach it in their own work. To make this more powerful, you could again use mentor texts that you have studied or samples from student work. There are countless ways to elaborate nonfiction writing, so the best place to start is with assessing the ways your writers use and don’t use elaboration strategies. You can scour nonfiction texts for examples to share and then put them on the chart with a descriptor so children will be able to recreate it in their own work. Remember Kathy Collins’s suggestion to find simplicity when teaching. Charts don’t have to be fancy or perfect, but they do need to be simple.